On the set of the newly-renamed "The Great Vegetable Rebellion" the first day of shooting with new co-star Willoughby the Llama was about to begin. The handlers trotted out the animal and publicity photos were taken of Marta Kristen and the purple creature reading the script together. 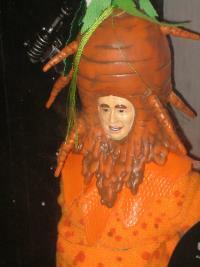 The initial scene to be filmed was to be an encounter between Tybo, Willoughby and Dr Smith who has been transformed into a giant stalk of celery. Scenes were run through, minus the cumbersome costumes, a few more photos were snapped and things seemed to be going well. Harris and Stanley Adams went off to Fox's wardrobe department to get dressed and ready to shoot. As the cameras began to roll it was learned for the first time that llamas like celery. A Lot. The talented Paul Zastupnevich's costume had a lot of real celery attached to it for effect. The animal rushed forward and began to chew on the costume while a terrified Harris was still wearing it, and, in its quest for food was getting dangerously close to poor Jonathan's private parts! For almost an hour, director Don Richardson kept the cameras rolling in an attempt to get the scene filmed, but to no avail-the llama would not leave "Celery Smith" alone. With what must have been a Smith-like shriek Harris balked. The llama had to go or he would not continue. Reluctantly the animal was removed from the soundstage and hopefully changed back to his normal llama colors, ending his career on Lost in Space. Now there was a big problem brewing. Shooting was over for the day, thanks to the actions of the purple furry brute at the cost of ten thousand 1968 dollars and fifty minutes of unusable footage. A human guest star had to be hired in a hurry to be the new Willoughby. Another script featuring the character of Willoughby, titled "Malice in Wonderspace" and written by Carey Wilber (not a fourth season episode as some surmised this was dated 10/31/67), one featuring Harris in drag as the Queen of Hearts, had to be scrapped. 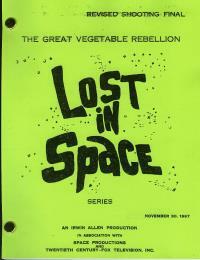 The shooting schedule for The Great Vegtable Rebellion went over by an entire day as Space's creative staff scrambled to re-write key scenes, substituting venerable character actor James Milhollin for the lost llama. James kept the name of Willoughby and donned a purple wig but he was not destined to be a recurring character in the series. According to director Richardson, when shooting resumed he instructed Milhollin to run at Harris and attack his celery-covered crotch as the llama had done the day before as a joke! Harris and the rest of the crew laughed, the ice was broken, and, for better of worse, the episode was shot and finished. The completed product was aired on CBS Wednesday, February 28, 1968 at 7;30 P.M. in most U.S. cities to mostly negative reviews which have continued ever since. Since this IS a review column I feel I must give my opinion of this much-maligned episode. As Lost in Space stories go, this one was pretty terrible. Giving the hideous script quality the poor people stuck performing in this show did a very adequate job. 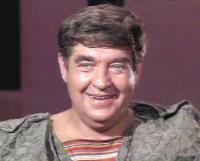 Stanley Adams, as usual, was terrific despite the fact that nothing but his (orange-tinted) face was ever seen. Scenes of Mark Goddard turning his face in an attempt to hide the fact that he was going to break out laughing are priceless. And a green-faced Jonathan Harris as a celery stalk is so surreal as to defy description. Good show? Bad show? Who cares-it's a great episode to watch if you can suspend disbelief for fifty-two minutes. Fast forward to eight years later, in 1976. Working in New York City at the Star trek Bi-Centennial Convention I learned that not only was Stanley Adams, star of the Star Trek episode "The Trouble With Tribbles" as Cyranno Jones going to appear at the convention, I would have the pleasure of interviewing him as well, thanks to the machinations of my good friend David Krinsky. And Stanley was willing to answer Lost in Space questions as well! In the elevator en route to Stanley's hotel room, David and I realized though we had our trusty casette recorder with blank tape in hand, we had no questions written down to ask him! (Hey, I was new at this.) In the space of about two minutes we scribbled about a dozen questions down on the back of a handy brown paper comic book bag. We entered the hotel room and shook hands with Stanley. He was a very genteel host, posing for pictures with us and answering all of our questions with insight and humor. Too quickly, the interview was over. Stanley shook our hands again, wished us luck and we left. Portions of the interview are reprinted in Flint Mitchell's new Lost in Space Encyclopedia for the curious. Lost in Space Forever! issue # 8, the fanzine I was publishing in those days for my fifty faithful subscribers in the United States and Canada was about to be released. I transcribed the tape and added a few photos, and when the magazine was completed, I mailed a copy to Stanley Adams at his California address (he was then staying at Rod Serling's widow's house). Imagine my surprise a week or two later when I got a letter from Stanley! 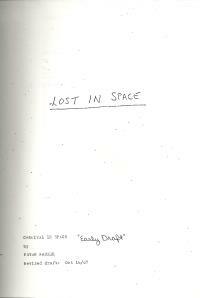 In LISF 8 was a Lost in Space fanfic story I wrote about the robot temporarily becoming human, which Adams had taken the time to read and compliment me on ("You got talent, kid...keep it up!" he said) He also mentioned he was heading to the East Coast to appear in a play and would send me some free tickets when he did. Under mysterious circumstances Adams passed away a few weeks later. To list Adams' myriad television and film credits here is unnecessary as anytime he appears on screen he is instantly recognizable, whether he's a giant carrot, an intergalactic huckster, or some other character. He was a talented performer and it always showed. And still does. 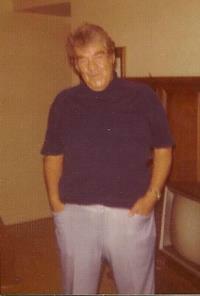 Stanley Adams in New York, 1976. 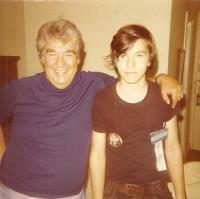 Stanley Adams and Bruce Fedow, 1976. The first page of the Carnival in Space Script. The Great Vegetable Rebellion script cover. Tybo lives! In the form of a stuffed animal (plant? ).